Even with this report I remain critical of the Mush administration as to how they treated this tragic event, almost like a circus, but at the same time emotions within me feel its time to bring closure to the issue of Mohtarma Benazir Bhutto’s death, she is sadly no more with us and what good will it do to continually rehash her cause of death, she is quite simply dead and no more amongst us. NewYork Times: Investigators from Scotland Yard have concluded that Benazir Bhutto, the Pakistani opposition leader, died after hitting her head as she was tossed by the force of a suicide blast, not from an assassin’s bullet, officials who have been briefed on the inquiry said Thursday. The findings support the Pakistani government’s explanation of Ms. Bhutto’s death in December, an account that had been greeted with disbelief by Ms. Bhutto’s supporters, other Pakistanis and medical experts. I have been writing about Benazir Bhutto’s will. Finally they released it today. There are reports which are coming in for the past few days that a major crackdown is underway in Sindh specially targeting the workers of Pakistan People Party to an extent that there are official reports of around 0.2 million people that have been arrested for their involvement and activities in the rioting following the 27th Dec assassination of Benazir Bhutto. The estimates as reported in Dawn today narrate the official figure to hover somewhere around 200,000. Its is surprising that even a week after the incident the police has been able to identify the culprits of the crime, the ‘official’ reason for these mass arrests happens to be their involvement in riots and looting that took place throughout the country in the days after the assassination of Benazir Bhutto. A number of Human Rights Activists working in these areas say that these mass arrests have nothing to do with those riots but instead are geared towards rounding up all opposition in an attempt to defuse their activities in the upcoming elections. This article appeared in the Telegraph today where Jemima Khan discusses Fatima Bhutto as the most logical heir to the Bhutto dynasty, I might also agree that the 25 year old has the brains and maybe the brawns to take over the reigns of such a big party, but will she? is still an open question. The most important issue to analyze that if she does stick her neck out for the top slot in the PPP will the Bhutto supporters rally behind her considering her ongoing difference with Benazir. I guess not… so honest advice would be for her to stay low and pick the fight at a later stage when the fruits are better for the picking, if she were to emerge now it could be political suicide as the strong Benazir sympathetic vote bank could rub her the wrong way. In other news, discussions in many circles around town, I am also told that if one were to search for a male leader within the Bhutto empire then a good option would be to keep an eye on Murtaza Bhutto’s son Zulfiqar Ali Bhutto (Jr), many who have met this young chap say that he is very ‘street smart’ and could be a logical choice, though he is only 18 years old, but far more mature then the adopted-name-sake-Bhutto Bilawal Zardari. Death duties are being reformed in this country and the upper limit extended. They don’t come more onerous than those left to Bilawal Bhutto, Zardari. Many Oxford undergraduates consider a career in politics; few are handed a political party, a new name and the statistical probability that you’re not going to die of old age, in bed. It is also not surprising that a few fake-facebook profiles have also come forward which impersonate the young new star, to the extent that a bogus statement, which appeared seemed to be a sincere response to condolences sent to a Facebook profile in the name of Bilawal Bhutto Zardari. “I am not a born leader. I am not a politician or a great thinker, it says. “Im merely a student. I do the things that students do like make mistakes, eat junk food, watch Buffy [the Vampire Slayer] but most importantly of all . . . learn. My time to lead will come but for now Im the one asking questions, not the one answering them. Its no surprise that the real Facebook profile remains camouflaged under a pseudonym which was researched and located from the Chirst Church Freshers 2007 group and he appears as Bilawal [actual name removed to protest his privacy] which the close family sources claim Bilawal has not accessed since his mothers death. The Sun was able to pull this picture from his profile on facebook which features him dressed up as a devil for a University function. — Bilawal, all I can say is welcome to stardom, Pakistan needs to know you better before they can trust you with their vote, but until then you have a few years before you come back so enjoy the limelight but at the same time just be careful, our hopes and the reputation of Pakistan lies interlinked, sorry for the added pressure, but that’s the price you might have to pay. As predicated by this scribe in a post on Jan 1st the only way ruling elite can ensure a weakened PPP is to slowly chip away and exploit the jealousies and rivalries of the Bhutto clan, this could be the start of such propaganda, I personally see three potential breakaway’s from this post-Benazir era, Mumtaz Bhutto, Fatima Bhutto & Aitzaz Ahsan. 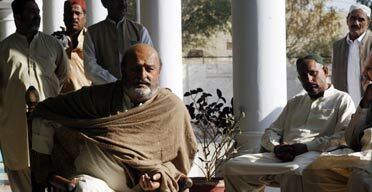 Mumtaz Bhutto sat back on the cool marble veranda of his sprawling country mansion in rural Sindh province. A guard brandishing a Kalashnikov stood behind him. A servant fanned the chocolate cake on the table to keep the flies at bay. He was dismayed. The rise of Asif Zardari, Benazir Bhutto’s husband, to the leadership of the Pakistan People’s party, was nothing less than a disaster, said Mumtaz, the sprightly 74-year-old head of the Bhutto clan. Family feuds are never pretty but for the Bhuttos, Pakistan’s dominant political dynasty, they are played out with the same intensity that characterises the rest of the family’s Greek tragedy-style history. Musharraf Addresses Nation – Nothing Special !! General Pervaiz Musharraf just finished his address to the nation but sadly its the same old dictatorship full of himself, in all honesty nothing has changed, Benazir Bhutto is out of the equation and the elections delayed by 40 days but its the same corrupt election commission, the same greedy President dearly clenching onto his seat of power and a the new face of Zardari on the set to win some influential seats in the upcoming polls. During his speech the President offered condolences to the grieving family of Benazir Bhutto, and also raised concern over the security problem that engulfed the country, he has hence forth deployed the Army and Rangers throughout the country with immediate effect entrusted to control the law and order situation. With the upcoming Muharram month the country will go through a very tense time, and we all dearly hope that the law and order situation holds up. On the day she was assassinated, Benazir Bhutto was due to meet two senior American politicians to show them a confidential report alleging that Pakistans intelligence service was using US money to rig parliamentary elections, officials in her party said yesterday. The report was compiled by the former Prime Ministers own contacts within the security services and alleged that the Inter-Services Intelligence agency was running the election operation from a safe house in the capital, Islamabad, they said. The operations aim was to undermine Ms Bhuttos Pakistan Peoples Party (PPP) and to ensure victory for the Pakistan Muslim League (Q) party, which supports President Musharraf, in the elections scheduled for January 8. It comes as no surprise that there is tremendous pressure on the Election Commission to hold the elections on time but the ruling elite know such a decision is doomsday for each one of them. Today yet again the spokesman for the Election Commission of Pakistan said that holding parliamentary elections as scheduled on January 8 “looks impossible. and the elections can be delayed. Kanwar Dilshad mentioned a deteriorating situation in 13 districts across Pakistan where there were security problems following the assassination of former prime minister Benazir Bhutto. There is now no doubt that the United States of America will be hounding the present regime to announce the general elections on time, it can be recalled that Condolezza Rice had called up Asif Zardari urging him to take part in the Jan 8th elections. It is now possible that the changing circumstances has now brought about some confusion within the minds of US lawmakers, on who to support. In all fairness I feel the onus lies on the United States to ensure a free and fair elections. It about time they stop patronizing Musharraf and remove him from Pakistan with immediate effect, install an independent caretaker government entrusting them the powers to form an independent election commission & hold free and fair elections. It is beyond certainty that the PPP will emerge victorious as the sympathy vote will over run them through into the parliament also feeding the American desire for a moderate ruling party. An elections with PML-Q and Musharraf watching over it would mean a Florida chad-like fiasco with an adamant government not willing to accept the results and the ECP fully in toe declining to declare the results, so its important to rehash the commission without Musharraf and Chaudhry’s watching over them.